We don’t make a habit of reproducing posts, especially quite recent ones. 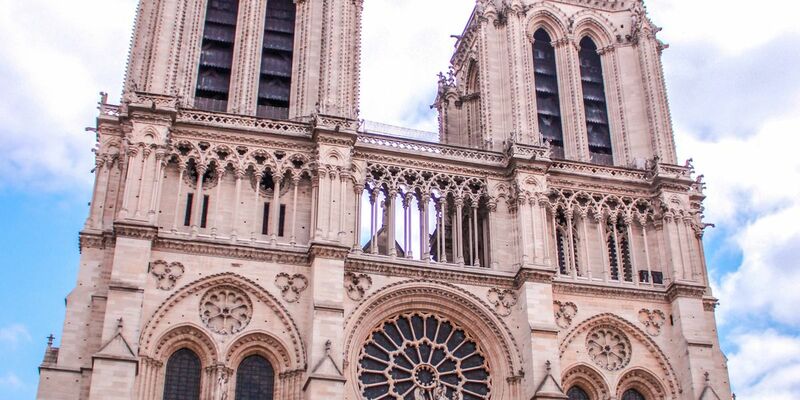 But at this time we should remember that Paris and Notre Dame have known hard times before. It was a relief that the Cathedral survived the Second World War though it was, like the city, exhausted and grubby, when Archbishop Spellman of New York passed through on his way to Rome and his cardinal’s hat in 1946. The post-war visit to the French capital by and large was anything but gay. For Mass in the great Cathedral of Notre Dame, each priest was still assigned one little piece of candle stuck in a bottle, which was carried from the sacristy by the server and carefully returned. Even when His Eminence gave Solemn Benediction at the main altar, there were only two candles burning. The streets were dark too, the streets of the City of Light, dark and dirty. The hotels were cold. The shops were shabby. Only the famous Flea Market, which seemed to be very much bigger than ever, was doing a thriving business. One candle in a neglected, dirty cathedral was a sign of hope, a sign of the Lord’s presence among his people. And even that one candle was an act of defiance to the darkness, the darkness will never overcome! So, Let your light shine, Notre Dame de Paris! May we all love our own church buildings for it is there that we meet as God’s family. If Notre Dame has many stories of the great and the good, the smallest village chapel has been the meeting place between God and his people. From ‘The Cardinal Spellman Story’ by Robert L Gannon, London, Robert Hale, 19963, p288. Here is a message from L’Arche for Easter. Stories are our lifelines. They run through us, helping us to make sense of who we are and where we have come from. L’Arche Kolkata in India has been holding, and telling, people’s stories since it was founded in 1973. This year, our Easter Appeal tells the story of L’Arche Kolkata. The Community is home to fifteen people with learning disabilities, nearly all of whom were orphaned, sometimes found on the streets or on train platforms. It is a place of sanctuary, belonging and joy for some of the most marginalised people in society. Every day L’Arche Kolkata welcomes a further fifty or so children and adults with learning disabilities into their workshop and daycare. As well as supporting people to develop new skills and take part in therapeutic activities, L’Arche Kolkata is a place where each person’s story is known and celebrated. L’Arche India also reaches out to some of the poorest families who are caring for children with learning disabilities. They provide vital medications, and services such as physiotherapy. Our Communities are a sign of hope in a hurting world. Read more about this year’s Easter Appeal, and donate, online. Featured are stories of individuals and families supported by L’Arche Kolkata, including Pam Pa and her son Somnath. If you can consider making a donation to us, we would be very grateful. Canon Anthony Charlton has published a tribute to the Franciscan Missionaries of Saint Joseph who are leaving the city and the parish after 27 years. For the rest of Canon Anthony’s message, Read on here. 7 March. Jean Vanier speaks to the ‘Flame’ conference. Jean Vanier recently spoke by video link to young people gather in London for a ‘Flame’ conference. This link leads to the text of his speech at ICN. 3 March: Margaret’s Story – as shared by L’Arche Flintshire. L’Arche Flintshire is based in North Wales, so being close to Saint David’s day it’s a good time to share this story which they invited readers like me to pass on. The community is newer and smaller than ours in Kent, and they are gradually discovering just what sort of community they are called to be. This is Margaret’s story. Margaret is a founding core member of L’Arche Flintshire. Since joining the Community she has volunteered as Flintshire’s Representative on the National Council, visited L’Arche Communities in the UK and overseas, and delivered talks about L’Arche in the local area. Here she reflects on the sense of belonging, and self-confidence, she has gained from being part of L’Arche. ‘I’ve been a part of the Community in Flintshire for a long time. For the last few years I have represented Flintshire on the L’Arche National Speaking Council. This means that occasionally I get to go off to meet up with other Communities and report back what I find out to the group here in Flintshire. Two years ago I went to Belgium on an inclusion course and performed a short presentation. From that I got to go to Belfast for the international [L’Arche] gathering. I came up with a workshop for about twelve people. [They were] all my ideas. We played ‘we’re going on a bear hunt’ but instead it was ‘we’re going on a house hunt’ and it was about all the places I’ve been to with L’Arche. I’ve really enjoyed getting to meet and know people from the other Communities. I’ve had lots of invitations from people to come and visit– I haven’t managed to go to them all yet, but I’m hoping to. I love L’Arche. Before L’Arche I was very quiet, although I bet everyone would probably disagree. It’s given me a lot of confidence in myself. I’m a different person. It’s helped me through so much. L’Arche gives us a chance to feel part of a community. We help each other to grow. We are a friendly group. If we have any sadness or any happiness we all stick together as one. We just lost one of our core members, but everybody is sticking together. We all brought each other up from that. March 2: David the Pilgrim again. In November last year, a small press magazine got word of my Cuyamaca 100k story and asked to do a short article on me. I was interviewed for an hour, the writer paused and said, “you need to write a book”, and that was the end of the interview! I am extremely humbled by the words of the author and that anyone would take interest in the tales of a back-of-the-pack runner like me. It is an odd experience for me, as it reads like “this story is based on true events”. It is definitely my story, but someone else told it. So, a few details aren’t as I would personally have depicted them. But, I believe the spirit of the story remains true. The main thing I wish were different is to acknowledge everyone involved, but the article is short and not all of (your and their) names or roles made it to print. I’ve decided as part of my New Year Resolution to tell the story of how I got here and the people and events that altered my life. It may take me awhile to write, but I’m committing to beginning “today”. I feel like everyone out there on the trails is more worthy than I am So, this isn’t about “me”, but I feel obligated to convey to others just how the ordinary people we meet in our lives are all part of an extra-ordinary plan. Here’s the link: I would be flattered if you take the time to read it and let me or the publisher know what you think. Wishing you peace and all good things in the new year, and thank you sincerely for being a part of my journey to come. 18 February: What is Theology saying, XLIV: What is Christian morality? What is Christian morality? In terms of content there is no Christian morality distinct from human morality. The Ten Commandments of the Old Testament and the precepts of the New Testament are simply human demands. But there is something different about Christian morality – just as people in Old Testament and New Testament times saw these human demands in the context of covenant with God and solidarity with Christ, faith today obliges us to see the demands of being fully alive as a response to the call of God. What difference does Faith make? It puts before us the attractiveness of Christ’s life – one that bears fruit in Resurrection, and promises the same Spirit, the same energy to anyone interested. Sensitivity to his values lifts lives above the minimum of good manners – turning the other cheek, going the extra mile, foregoing legitimate rights for wider benefit. Belonging to a community of faith also makes demands – sharing a Sacramental life, which is not the case for non-believers. Important as these differences are, the basic moral demand is to become what we are potentially – fully human: “God is praised when we are fully alive…” – Irenaeus. And we don’t grow alone. Our roots are in the earth, and life and health and growth emerge from our relationships – we are what our relationships let us be. A moral life is to be in a right relationship to all of these. Our love for God is only known via the test of service – “unless you did it to these…”! Sin turns self into God – and pride, lust, avarice, abuse and aggression are the certain fruits. Sin is not a problem, problems can be solved, sin is an ever present mysterious reality, in the world, the Church and individuals. It is a reality to be concerned about, but not to be afraid of: “Where sin abounds, grace abounds even more” – Romans 5.20. Jesus is the forgiveness of sin, but unless we are convinced of our sinfulness, how do we recognise our need for him, or rejoice in what he makes possible?